I made this two weeks ago but forgot to post about it. 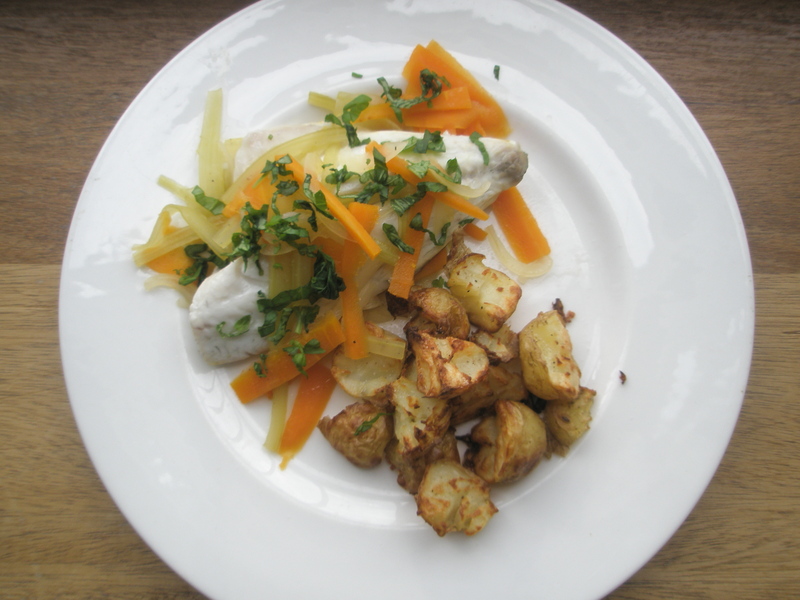 Escabeche is a great sweet and sour type sauce to serve with and cook fish in. To be honest I can’t remember the quantities I used so I’ll just be crap and say it involved white wine vinegar, sugar, water, celery, onion and carrots and the fish. I sliced the veg very thinly and cooked them in the vinegar and sugar mixture then poached/steamed the fish on top of it. The end result should be light and fresh with the veg still crunchy and the fish delicate and soft. I believe I scattered this with some basil at the end to lift it slightly. And that’s about that folks, less a recipe more of a vague memory but give it a go, it’s good to experiment now and again! Oh, yeah, the smashed potatoes, these are gorgeous and make a brilliant accompaniment to many a dish, boil your new potatoes until just cooked through. Pre heat the oven then plop the potatoes into a baking a tray, break or smash with a fork, drizzle with oil, season with salt and pepper (or you could add spices or herbs) and whack in the oven at 220 degrees until golden and crispy. Bang! Spud heaven! I like escabeche and will be sure to try making it your way.